I finally got my Wood River Side Rabbet Plane after ordering it about 2 months ago. It’s main job is to clean up the sides of rebates and grooves. It has two blades that can be set independently. They can be used left or right handed and can be used in either direction of the grain. There is a nose or toe to put pressure on the wood to give you finer shavings but it is a bit too far from the blade. The nose can be taken off so you can plane all the way to a stop. There is a fence that can be reversed to use in the opposite direction and can be set to the depth of the groove. The fence aids in controlling the plane while shaving the sides of a groove. The screw holding the bullnose in was not screwed all the way in when they machined the front so most of the head was machined off. The guys at WC used a needle nose to unscrew it. Went to a local hardware store and got a m4×20 screw which fit perfectly. Sole was decently flat and took just a little work to get it really flat. A lot of the edges were knife sharp so I just sanded some of the edge off. Picture of screw cut off in machining the front of the nose. The blades were really in bad shape. The flat backs weren’t really flat with rather coarse machining lines. One had a slight dip behind the edge which is similar to the dip in Japanese blades called an ura which I thought was ok because it would make quicker work getting it flat to the edge. But the other one had a huge rise right in the center of the blade which took a lot of work to flatten. I took about 300 strokes on the extra coarse diamond stone and it didn’t seem to be flattening. I ended up using a Japanese technique of putting a long piece of wood on the blade and bearing down on it with my weight. Finally flattened. The bevels also were not flat but being smaller took a shorter time to flatten. To flatten I used an extra coarse diamond stone, then coarse diamond, then 1000 grit Bester stone, then a 3000 natural Japanese stone and finally a 8000 King stone. For the bevel I started the sequence with the 1000 grit Bester. The Bester stone cuts really fast but I think its closer to an 800 grit. Pushed down on the two ends of the blade and only the middle touched the stone. 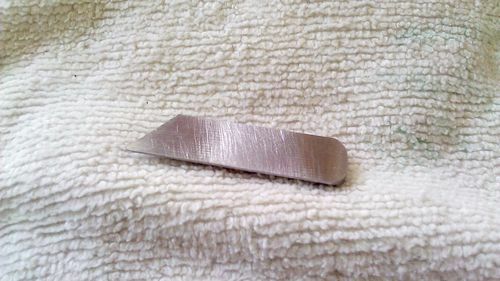 The nose (or some call it the toe) can be taken off so it can be used in stop grooves but the gap between the blade and the nose is not adjustable and is too large for fine shavings. I don’t see a way to modify it to close up the gap. I might try to make a wooden one. But after sharpening and some tuning the shavings were even, fairly thin and left a very smooth surface. The depth of cut is difficult to adjust. There is no screw to adjust the depth and there is just a small part of the blade sticking out the side to use to push the blade. No easy way to move the blade a few thousandths of an inch. I use a technique used on Japanese planes of tapping the back end to pull the blade back out a little. I have to start with the blade cutting too deeply then just loosen the hold down bolt just enough to let the blade slide a little, tap the back (I use a foot long 2×2 maple as a hammer so I don’t dent anything), screw in the hold down and try it. Its rather tedious and takes awhile but I haven’t figured out a better way to do it. There is also no way to adjust lateral movement of the blade which could cause the blade to cut one side deeper than the other..
After two hours of sharpening and adjusting plus running around for the sheared screw it actually cuts very nicely and is quite easy to pull through the groove. Does a nice job of cleaning, straightening and adjusting the widths of the sides of grooves. So its a tool I’m glad to have for those times when you have to widen a groove incrementally or just clean the sides up. Didn’t like the way it came from the factory and adjusting the cut is difficult to master. After working to flatten the back of the blade and getting a really sharp edge at least future sharpenings will be easy and quick. I considered getting the Veritas at $129 plus shipping but the Wood River at $69 without shipping was half the cost. The Veritas would have probably have taken less time to sharpen and tune but it also didn’t have an easy way to adjust the blade and the gap between the nose and the blade also looked rather large. I don’t shave the sides of grooves enough to warrant spending that much so despite the negatives I really like this plane. I recommend it for those that are good at sharpening and setting up planes. I ended up with three stars. Plane cuts and handles around 4 stars, adjusting it is about 3 stars and fit and finish about 2 stars. Wow. You had to go through alot to set that up. Your more patient than I am. I would have returned it to woodcraft once I saw the screw. Good review, very informative and detailed. But I’m thinking the same as WayneC – you’re very patient with something that is brand new; more than I would be. Thanks for the comments. Well, I guess I waited about 8 weeks for the plane to come in and only one of them arrived so I didn’t want to wait another 8 weeks. 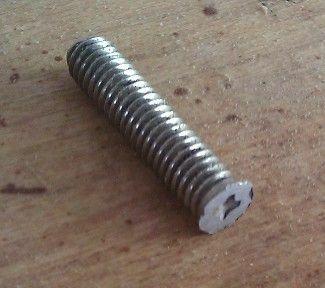 The screw looked like a common one so I told WC I wanted to see if I could find it and they said if the search was futile bring it back and they would send for another one. Sharpening and tuning planes are kind of my passion and I always learn something when tuning planes especially one so badly finished. I left a review on WC but I haven’t seen it pop up yet. I hope they get the manufacturer to brush up on their machining of the plane. Ok, and I’m also retired so I have time on my hands. Very informative review. Thanks for explaining why you rated it at the level you did. I hate it when a person writes a review and does not list any cons, then gives it 4 stars. I’m sorry you had this experience. I work at WC as an instructor. I’m not speaking for WC, just my sentiments. I’m sorry but that quality is rediculous. I’d blame QA more than the manufacturer. The screw head is clearly showing for cryin out loud. How could they miss that? I’m not a hand-plane guy but it sure seems that even with WoodRiver, it shouldn’t be that bad. I hope it works well for you in the long haul. The owner and the workers at the local WC are great guys and good friends. They were all shocked at how badly the machining was on my plane. Yesterday they said another one came in and I took a look at it and the screw in the front was ok. Can’t attest to the flatness of the blade as the plane was in a clear plastic bag and I didn’t want to break it to check how flat it was. After working on it the plane works very well and I can see it helping me out in working with grooves where I can’t think of a better way of taking a few thousandths off the side of a groove. I think the other side rabbet planes have the same issues but would come better machined. I hope they improve the machining otherwise plan one doing some work on it. Here’s a strange use for the plane. My neighbor brought over a shotgun stock that he broke off a 1/4” x 1” piece along the bottom slot where the trigger part of the shotgun slides into. The slot is about 3/4” wide. He lost the piece and glued in a piece of pine that didn’t fit and looked really bad. So I cleaned up the break and glued in a walnut piece which fit perfectly. But I purposely let it stick out about a 32nd into the slot so I would just sand it down flat with the existing part. Then I looked at the side rabbet plane saw that it easily fit in there and it made quick work of shaving out the excess. It sounds more like you purchased a “Plane kit” than a working plane. Yes, Don. That’s a good description of how this plane came. The other one at WC looked better machined so I could have gotten the bottom of the barrel. All the planes I get need some work. Some like Lee Valley, Leigh Neilson and the V3s from Wood River come in good shape and plane nicely out of the box but with a little honing they produce amazing shavings and surfaces and keep their edge. Japanese planes I expect to come unusable because each wood worker wants to set it up their own way and the setup is totally different from western planes. The sole is setup with a tiny concave that I found totally contrary to how I was taught but without it they don’t work very well. I think that’s why some don’t see how amazing they are. But this side plane should have come in decent shape but was among the roughest I’ve seen. By the way, Don, just visited your site and you do amazing work. LOL with Don, that’s what I was thinking. At least it didn’t have a tote and knob that you had to refashion. These have been on my list for a long time but I think I’ll save my pennies a bit more.